✔ PETS LOVE THEIR TREAT DISPENSER HOME --- This coconut shell bird house by SunGrow provides the perfect hollow space for placing treats and bird seed. Finches, sparrows, and robins will flock to this eco-friendly bird house. Your beloved pets will love getting food inside their natural habitat. 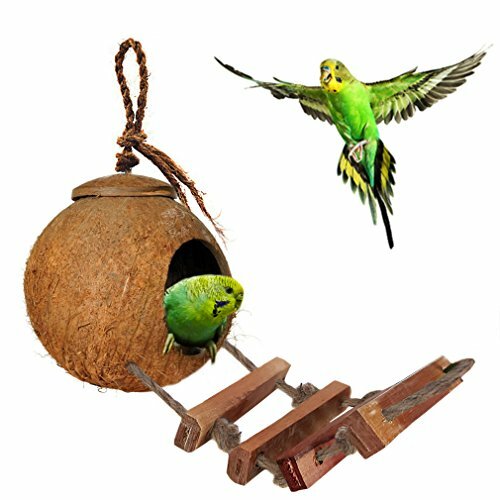 ✔ ASSISTS IN YOUR PET'S EXERCISE --- The rough wooden rope ladder and coconut fibers, provide a variety of natural textures which encourage foot and beak exercise of your bird. It will keep him/her healthy and active. ✔ 100% SAFE AND NATURAL PRODUCT --- The SunGrow Birdhouse is made from a completely natural coconut husk, making it 100% safe and non-toxic. Also, this tropical island inspired birdhouse will add an exotic vibe to your parakeet's cage. As it is a natural product, it will also blend nicely into your garden, unlike plastic bird house models. This quality of the product makes it the perfect eco-friendly birdhouse for your feathery friend. ✔ MADE FROM STRONG & DURABLE MATERIALS --- The SunGrow Birdhouse is made from one of nature's strongest materials ensuring its durability. It is the perfect shelter for your chirps even in extreme weather conditions. Additionally, this coconut shell bird house will never rust or get moldy unlike any other bird house. Also, its organic composition makes it highly attractive to your pets. ✔ PERFECT SIZE FOR SMALL BIRDS --- On an average, the bird house has an opening diameter of 2.4 inches and the coconut shell diameter is about 5.1 inches. As these are natural products, the measurement can vary a bit though.